POOL: With last Thursday (Mar 1) being the Buddhist Makha Bucha Day, the 11th round of the Patong Pool League (PPL), sponsored by Thailand Pool Tables, was spread over various day of last week. 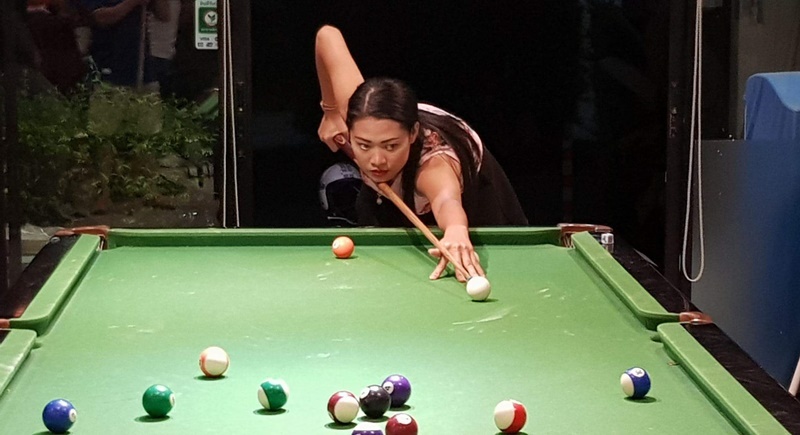 Khun Oye from Happy End Bar – an experienced player with cool and accurate shots which make her very hard to beat. League leaders Natalie Bar, one of only two games to be played last Friday (Mar 2), were hosted by Simon & Oils and took a commanding 1-10 away win thus extending their lead in the table to some 11 points. Natalie Bar were a player short with just a few hours to go until play got underway, but luckily for them Cha Cha, who usually plays for Wet Dreams came to their aid and made up the numbers. However, in true PPL spirit Simon showed Cha Cha no mercy and beat her in the singles game, this being the only point Simon & Oils picked up in the match. But Cha Cha got her revenge by winning the doubles game and assisted in bringing the 10 points for Natalie and her team. Earlier in the week, on Tuesday (Feb 27), Hole in One took on Happy End Bar at home. The home team started strongly picking up all six points available in the singles matches. The remaining games were close and could have gone either way, but Hole in One eventually walked away with a comfortable 9-2 win. However, on a positive note for Happy End, this week will see the return of one of their regular players who hails from Belgium and they will be hoping he will return and be able to power up the team once again. Elsewhere on Tuesday, Wet Dreams, whose owner has just sold up, were placed against Martin Swiss and the later managed to take away an good 4-7 win. On Wednesday (Feb 28), Wombat Bar took on Caddy Shack with both teams being in excellent shape. Stu and Brett from Wombat had a good day both winning their singles and doubles games. A lot of the other games were close but Wombat managed to walk away with an impressive 8-3 victory. In the final game of last week, which was also played on Friday night, Ting Tong played against Red Light. The visitors came very close to causing an upset and were even leading before the final beerleg. Red Light’s top player Scott returned from his holiday but had clearly not been practising during his time away. Scott’s poor performances on the night saw his team go down 6-5 to Ting Ting in a game which many described as an “absolute thriller”. It’s all back to normal for this weeks PPL action with all games reverting back to their normal Thursday night schedule.